Remove configuration from the previous lab. You will need to prepare for the migration towards 10Gbps. As a test, you have been asked to change the metric on R6 so that a 100Mbps link should have a metric of 100 instead of 1 (default). If the result of the configuration is satisfactory, restore the default cost calculation on R6. What are the options to change OSPF metric in an consistent manner? As soon as you change the default auto-cost reference-bandwidth, you get the warning as shown below. The same configuration should be applied on all routers in the OSPF domain. In our case it is just a quick test, so we will revert this back to the default value. Pic. 3 - New Metric on R6. Pic. 4 - Metric on R6 Restored. If a network designer wants to apply consistent metric in Cisco OSPF domain, there are two common solutions in use. In the first one, a consistent bandwidth-to-cost conversion table can be created similar to the one STP uses. Then, the designer can use 'ip ospf cost' command throughout the domain to manually apply the costs on every interface. Alternatively, every router can have the value of auto-cost reference-bandwidth changed using the new value (default = 100, representing 100Mbps). Configure OSPF area 0 between R1 and R2 using Frame-Relay connection (Ser0/0). After you have completed Task1, check OSPF path on R2 towards the rest of the OSPF domain (check next-hop router's address). Configure R2 to use the newly created Frame-Relay link as the best path. Use interface cost command to accomplish this. How does OSPF calculate the metric on Cisco routers by default? How can you influence the path selection in OSPF? How does Cisco OSPF router calculate the cost by default (as of writing this post)? How would you configure support so that the higher than 100Mbps interfaces have their cost automatically calculated? It is a good idea to check how R1 is already configured (ospf mode, authentication etc.) in order to configure R2 properly on Frame-Relay link. R1 uses simple password authentication in area 0 but it is disabled on Fas0/0. R1 does not have Frame-Relay IP mapping towards R2 (R2 has this mapping towards R3; not shown here). Pic. 2 - OSPF Neighborship Verification. Pic. 3 - R2's Routing Table. For all OSPF destination R2 uses FastEthernet0/0 as expected. Pic. 4 - R2's OSPF Costs of Interfaces. The last thing to complete the goal is to change the cost of the interface preferring Serial0/0. Pic. 5 - R2's Current Routing Table (after few seconds). R2 prefers Serial0/0 as its outgoing interface for all OSPF networks. cost = ref_band / bandwidth_of_the_link. Remove the configuration used in the previous lab. On R2 configure a static route towards 10.0.8.8/32. Configure R2 so that it advertises the default route into OSPF domain as long as there is connectivity between R2 and SW2 Loopback0 interface (10.0.8.8). You should use IP SLA to accomplish the goal. IP SLA should track the object that will perform ping test every 3 seconds and the timeout should be set to 2 seconds. What is an advantage of using this solution? Make sure that SW2 has these two static routes configured for the next task to succeed. Also, make sure that R2's FastEthernet is UP (we brought it down in the previous lab for testing purposes). Depending on which IOS version you use, the syntax to configure ip sla probe may be different. Try to check the syntax using: ip sla ? Pic. 2 - IP SLA Activated. My router's date and time are not set properly. This solution requires the presence of a bogus/fake network entry in the routing table (here: 1.1.1.1/32). This is the condition for default route advertisement. As long as 1.1.1.1/32 is present in the routing table, R2 advertises the default route into OSPF. This entry (1.1.1.1/32) will be present in the routing table as long as object 1 receives success from IP SLA 1 probe. Pic. 3 - R1 Receives Default Route. This is a more reliable method of injecting a default route into OSPF since it will rely on non-direct failure. Perform the test by shutting down 10.0.8.8 on SW2. See, if the default route has been withdrawn. Below, is what happens to IP SLA when SW2 shuts down its loopback0 interface. Pic. 4 - IP SLA Statistics on R2 (SW2 Loopack Down). As a result of that, 1.1.1.1/32 disappears from the routing table on R2. Pic. 5 - 1.1.1.1/32 is Missing. And R2 stops advertising the default route. Pic. 6 - R1 Loses Default Route. As soon as connectivity to 10.0.8.8 is restored, the default route R2 advertises into OSPF again. Remove the existing default route injection on R2 (including default static route). Configure R2 to generate a default route into OSPF assuming that 172.16.28.0/24 is present in its routing table. How can OSPF inject the default route based on the presence of specific route entry in its routing table? Pic. 2 - R1's Routing Table. Now, in order to simulate the removal, shutdown FastEthernet0/1 on R2. It should no longer propagate the default route. Pic. 4 - R2 Loses access to 172.16.28.0/24. As a result of that, R1 no longer receives the default route from R2. This can be seen in the 'debug ip routing' on R1 activated before R2 shut down it Fas0/1 interface. Pic. 5 - Debug IP Routing on R1 Before R2's Fas0/1 Shutdown. OSPF command 'default-information originate' is already a conditional route injection. It will originate the default route into OSPF if the router has the default route itself. In case, the router with 'default-information originate' command loses the default route from its routing table, it will withdrawn the default route from OSPF domain. OSPF can also originate the default route, without having it in its routing table. You need to add the 'default-information originate always' keyword (the one in red), to originate the default route unconditionally. However, OSPF also uses conditional default route injection method in which the router will check for presence of any prefix specified in the route-map, just like presented in this lab. Make sure that the tasks in the previous lab are completed before proceeding with this lab. Also, this is NOT a best practice lab. It creates a potential problem and provides solution to it. Configure summary route 10.0.0.0/22 on R4 so that the area 3 does not receive more specific LSAs in the range given (10.0.0.0 - 10.0.3.255). Ensure that R5 has connectivity to the routes summarized by R4. Configure R4 to accomplish this. What problem can prefix summarization create in OSPF domain? What do OSPF, EIGRP and BGP create in their routing table while doing route summarization? What does Null0 summary is designed to do? What problem is this task list going to create? Pic. 2 - R4's OSPF Table Before Filtering. Pic. 3 - R4's OSPF Table After Filtering. 10.0.1.1/32 and 10.0.2.2/32 are now missing (but they are still in LSDB). Pic. 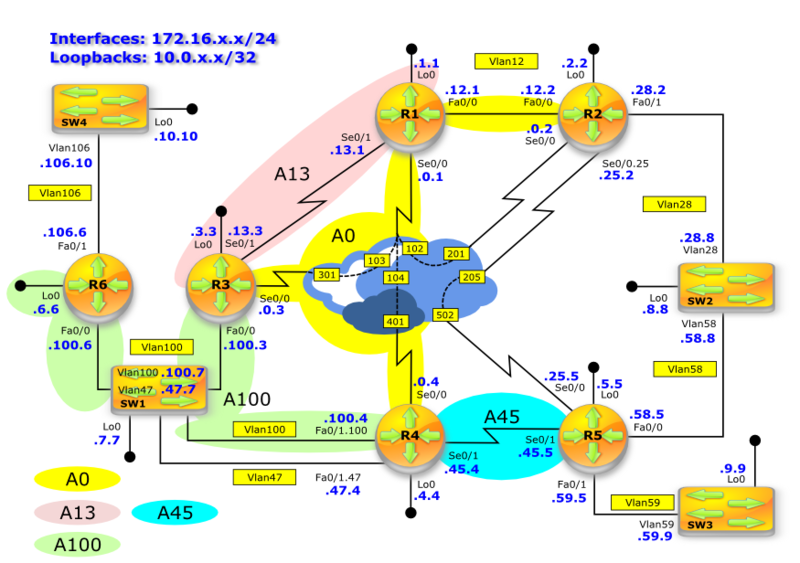 4 - OSPF Routing Table on R4. R4 has the default route as per previous lab, but since summarization has been configured, it also creates 10.0.0.0/22 summary route pointing to Null0 interface (default behavior of OSPF, EIGRP, BGP). Pic. 5 - R5's Routing Table After R4's Summarization. Pic. 6 - R5 Ping Test to Summarized Prefixes. R4 sends ICMP host unreachable to R5! R4 has the summary route with Null0 interface as the next hop for more specific routes (10.0.0.0 - 10.0.3.255 in this case). This summary route pointing to Null0 interface assumes that R4 has more specific entries in the routing table (filtering in task 1 has removed those entries from the routing table). Even though R4 has the default route It will NOT use it due to the presence of summary route. Packets are being dropped on R4 creating a black hole. This will remove the discard route (null0) from OSPF routing table (compare with pic. 4). Pic. 7 - OSPF Routing Table on R4. Only default route is present now. Pic. 8 - R5 Ping Test. While using route summarization it is possible to create a 'black hole' for the traffic or sub-optimal routing in the domain. It is imperative to remember that route summarization introduces a summary route with the Null0 interface as the next hop. It is called 'discard route'. It prevents a router from using a shorter match (default route for instance), if the more specific destination network is not present in the routing table. In this lab, the problem has been introduced which resulted exactly as per 'discard route' role. This design if definitely not the best practice. It only shows the possibility of removing the 'discard route' from OSPF table in order to accomplish the task given stipulations.